I get a lot of questions from investors — clients and readers alike — and one of the most frequent questions deals with how rising interest rates will impact the markets. People have been worrying about this since rates began to fall in the midst of the financial crisis. This relationship is typically not what people assume. This piece I wrote for Bloomberg shows why investors should be more concerned with rising inflation as opposed to rising rates. Investors tend to attach narratives after events like the recent bout of market volatility as a way to provide comfort in the face of market uncertainty and losses. Although there could be any number of causes for the downturn, recent data on an uptick in inflation and rising interest rates are two of the stories that have gained ground. Both can play a role in shaping market expectations, but one, inflation, has a stronger relationship with poor market outcomes. It would make sense for investors to get spooked by each of these factors from a textbook perspective. Rising rates in fixed-income investments provide more competition for stocks from an asset-allocation standpoint and increase the cost of capital for corporations. Inflation could lead to an increase in wages and input costs, which has the potential to hurt corporate earnings if companies are unable to pass along their increased costs to customers. But inflation and higher rates are two separate issues. Rising rates can be caused by rising inflation, but the two aren’t mutually exclusive. We can look at each on its own to see how it has affected stock market performance historically. The 10-year Treasury yield is now up about 160 basis points since bottoming in July 2016. Using data from the Federal Reserve, I looked at each instance when rates rose 100 basis points or more since 1962 to see how stocks fared during rising rate environments. 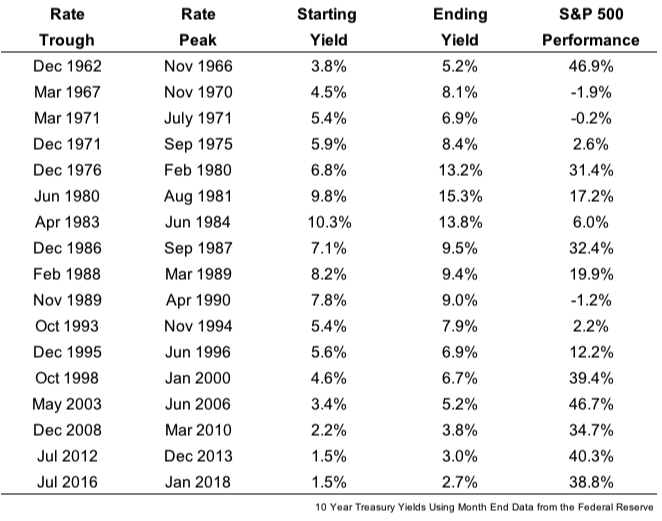 Although rates have been in a massive downtrend since the early 1980s, there have still been plenty of countertrend rallies in rates, along with the rising rate period in the 1960s and 1970s to test. Including the latest run-up in yields, there have been 17 such instances in this time. The average performance of the S&P 500 during these past rising rate environments was almost 22 percent in total returns. Only three times did stocks fall when the 10-year rose by 1 percent or more, and the largest losses were just under 2 percent. So stocks have held up well in the face of rising interest rates over the past 50-plus years. Yet the end of a rising rate environment coincided with a peak in the stock market that preceded a large decline in a few instances. Rates rose leading up to the 1987 market crash as well as the popping of the dot-com bubble in early 2000. There was also a bear market after the rise in rates in 1966 along with a 19 percent pullback in the summer of 1990. While stocks have held up well during rising rate environments, the record shows returns are much lower from the impact of inflation. From 1928 to 2017, when inflation was below 3 percent in a given year, the S&P 500 showed a median return of close to 16 percent. But when inflation came in above 3 percent, the median return for stocks was just 6.5 percent a year. A similar pattern emerges in periods of rising inflation data. In the years when inflation was lower than it was the previous year, the median return on the S&P 500 was 18.3 percent.1 Yet the median return on stocks was just 5.6 percent2 when inflation came in higher than it did the previous year. So, it would make sense for investors to be more concerned about rising inflation than rising rates. Both could occur at the same time, but inflation appears to be more menacing to stocks when we look at these variables separately. Inflation is still running at just 2.1 percent based on the latest reading, so it’s still below average based on the past 90 years or so of data.3 Inflation is something investors should be on the lookout for in terms of underappreciated risks. What’s good for wages may not be a great thing for investors. 1Inflation came in above the 3 percent level 41 percent of all readings and below 3 percent 59 percent of the time. 2Inflation was higher than it was the previous year 54 percent of all readings and lower 46 percent of the time. 3The average annual rate of inflation since 1928 was roughly 3 percent. Originally published on Bloomberg View in 2018. Reprinted with permission. The opinions expressed are those of the author.